Read the Supplementary Appeal here. This Supplementary Appeal reflects the extent of the humanitarian needs in Nigeria, some of which have become apparent in the last several weeks. It outlines UNHCR’s scale up plan and consequent funding requirements to meet the increased humanitarian and protection needs of displaced individuals both inside the country, who have been without access to assistance since the beginning of the conflict, and of refugees returning from neighbouring countries. Building on existing Government resources and capacities, UNHCR will support the Government-led response, in particular by the National and State Emergency Management Agencies (NEMA/SEMA), in line with the Government’s plan for rebuilding the northeast (Buhari Plan) announced in June 2016. Activities planned under this Appeal are also aligned with the United Nations Scale-up Plan for northeast Nigeria, coordinated by the Office for the Coordination of Humanitarian Affairs (OCHA) and based on the individual agencies’ scale-up plans to meet priority sectoral needs for internally displaced populations (IDPs) and their host communities. The 2016 Regional Refugee Response Plan (Regional RRP) for the Nigeria situation will remain the main coordination and planning tool to cater for the protection and life-saving needs of Nigerian refugees living in Cameroon, Niger and Chad. Since January 2016, counter-insurgency operations launched by the Nigerian security forces, in cooperation with the Multi-National Joint Task Force, have intensified against the extremist group Boko Haram. The army has reclaimed many of the main towns and villages in Borno, Yobe, and Adamawa States in northeast Nigeria, enabling access and revealing the full effects of the conflict on civilian populations. The security situation remains fragile with sporadic insurgent attacks severely impacting on humanitarian needs, access and response priorities. As the military continues to recapture territory and secure civilian locations, more areas are expected to become accessible to humanitarian organisations in the coming months. 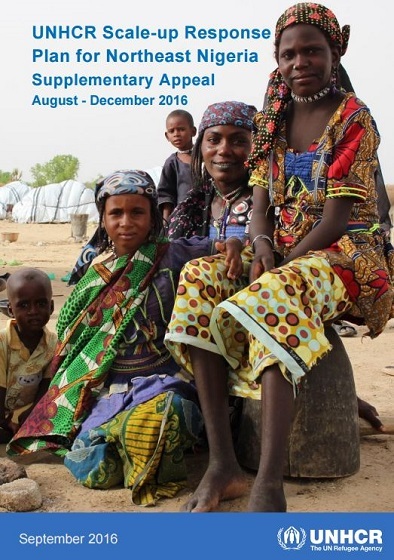 According to the latest Displacement Tracking Matrix (DTM) report of August 2016 released by the International Organisation for Migration (IOM), an estimated 1.87 million people have been internally displaced by the Boko Haram insurgency in the northeast, 77 per cent of whom are hosted in Borno State. In recent weeks, access to previously inaccessible areas in Borno and Yobe States has allowed humanitarian agencies to identify up to an estimated 800,000 IDPs in dire conditions and requiring urgent lifesaving assistance. 7 active combat and resulting security restrictions, camp coordination and camp management (CCCM) and humanitarian assistance in the IDP camps are delivered mainly under the auspices of military personnel, with resulting constraints on humanitarian space. Significant numbers of Nigerian refugees have returned from neighbouring countries of asylum, sometimes under circumstances deemed by UNHCR to be inconsistent with international law. An estimated 106,000 returnees have gone back to accessible and non-accessible areas, some of whom are in IDP or IDP-like settings and are in need of registration services, and reintegration assistance such as shelter, protection-based material assistance and psycho-social support. This number includes an estimated 67,000 identified in newly accessible areas of Borno State, and who are staying in abandoned public buildings largely destroyed by Boko Haram. With around 81 per cent of IDPs living in host communities, resources are being depleted and services severely strained. IDPs and returnees hosted in camps and displacement sites are often living in congested shelters or isolated in insecure or inhospitable areas, making them vulnerable to exploitation and abuse. Protection monitoring visits conducted by UNHCR in IDP sites in Borno revealed challenges related to access to water and sanitation facilities, shelter and freedom of movement in and around camps, limited access to medical care, and dire food shortages. Although most IDPs reportedly wish to return to their areas of habitual residence, conditions are not yet conducive for voluntary, safe and dignified return. Furthermore, the insurgency and related displacement continue to negatively affect livelihood opportunities. Affected households have had consecutive years of restricted income levels, destruction of assets and livelihoods, and reduced food access, leading to increasing trend of negative coping strategies. The number of people in need of food assistance in north-eastern Nigeria has risen to 4.4 million as at August 2016, according to the Food Security Sector. The additional financial requirements requested in this Appeal will enable a rapid scale up of UNHCR operations initially until the end of 2016, and thus contribute to a holistic and targeted protection and assistance response in newly accessible Local Government Areas (LGAs) in northeast Nigeria. These requirements are expected to go into 2017 and may be the subject of an additional Supplementary Appeal.